Open source experts from the public sector, SME and Plone community participated in the first Plone e-government international workshop. After two days of intense work the group decided to merge into 1 common project 3 e-government initiatives: CommunesPlone (Belgium, France), PloneGov.ch (Switzerland) and UdalPlone (Basque Country, Spain). 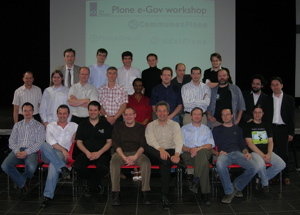 The new project, based on the open source Content Management System Plone, will be named PloneGov.org. It now reaches over 40 local governments and 2 regions in 5 countries. The workshop goal was to set the path to international collaboration and coordinate the development of generic open source solutions adapted to the needs of the public sector. The event outlined the benefits of international collaboration in term of economy of scale, sharing best practices, investments and development. PloneGov.org aims to become a central point of information for Plone based e-Government solutions. Attendants, equally representing the public sector, Plone community and SME's, came from several countries : Belgium, France, Switzerland, Spain, Argentina, The Netherlands and Luxemburg.